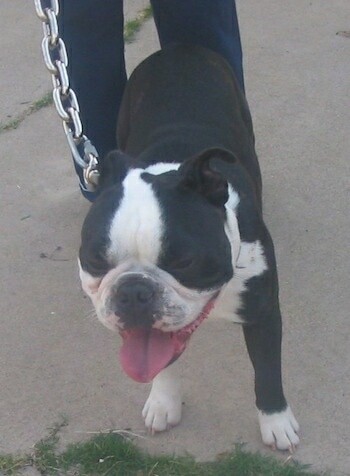 Deacon the Boston Terrier / English Bulldog mix at 6 years old— "Deacon was born on 8-8-08 in Riverside, California. His mother was a Boston Terrier and his father was an English Bulldog. He is extremely sensitive and emotional and demands attention. He prefers to sleep under covers with a pillow and cuddled up." The English Boston-Bulldog is not a purebred dog. It is a cross between the Boston Terrier and the English Bulldog. The best way to determine the temperament of a mixed breed is to look up all breeds in the cross and know you can get any combination of any of the characteristics found in either breed. Not all of these designer hybrid dogs being bred are 50% purebred to 50% purebred. It is very common for breeders to breed multi-generation crosses. 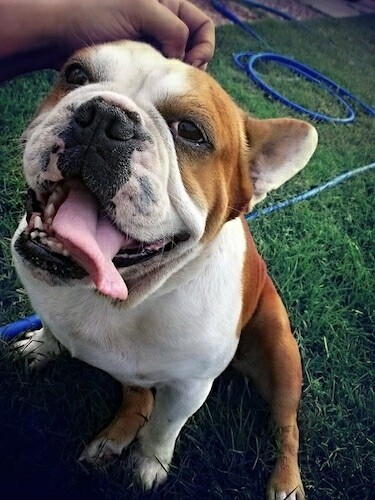 "We have had Bocephus since he was 6 months old. Bocephus is a 3-year-old, 45-pound, English Boston Bulldog (mother: English Bulldog, father: Boston Terrier)." Jake the English Boston-Bulldog—"His father is an English Bulldog and his mother is a Boston Terrier. A great addition to our family." "We just adopted Scarlett, a Boston Bulldog (Boston Terrier / English Bulldog). She's a sweet, but feisty 2-yr-old. What a great addition to our family!!" Bailey, English Bulldog / Boston Terrier hybrid (English Boston-Bulldog) puppy at 4 ½ months old— "Bailey was the runt of the litter and is full of energy and attitude. She has proven to be very smart and has mastered every trick and command possible within her first 4 months. Never stops wanting to play and is a sucker for peanut butter." Henley the English Boston-Bulldog puppy at 2 months old— "He is an English Bulldog mixed with a Boston Terrier. He is full of energy when he is awake, which is a maximum of 4 hours a day." 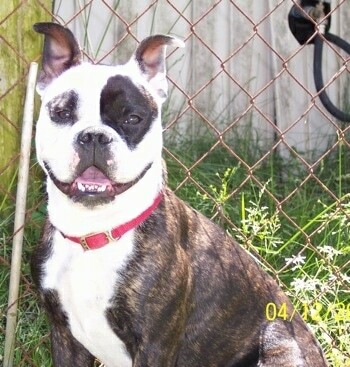 Chloe the English Boston-Bulldog at 10 months old— "Her mom was an English Bulldog and her dad was a Boston Terrier. She likes to play with her stuffed animals and anyone that will play with her! She is a real sweetheart!" "This is Marvin, a 1-year-old Boston Bulldog. His mother was a Boston Terrier and his father was an English Bulldog. He is a happy and energetic guy who's just as happy snuggling in bed as he is chasing a ball outside. He is very outgoing and incredibly playful. He is adored by everyone who meets him!"